Read, or watch, what some of our customers have said about their experience with Tailor Decks. Contact us to discuss your project by using the form below or call us at 770-725-4646. I am in awe of the gorgeous screened porch that John and his team at Tailor Decks built for us. They designed and built a 20-foot high gabled screened porch to fit unique design needs I had, and they surpassed my expectations with the quality and the beauty of the finished product. Everyone that enters my home compliments the screened porch. The craftsmanship is impeccable, and they are the epitome of exceptional customer service. 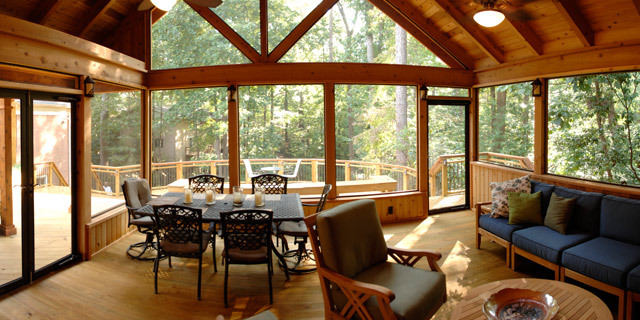 I don't plan to sell my house any time soon for fear of leaving my screened porch behind!" Tailor Decks did a great job and we are extremely pleased. All of the deck construction work was done by their employees, and it is clear that they are dedicated to outstanding, high-quality work. The project stayed on schedule, the worksite was always neat, and the staff was professional and courteous. This was probably the best contracting experience we've ever had, plan to use them again for another large project, and highly recommend Tailor Decks to everyone we talk to!" My wife and I spoke with many contractors before making the decision to have Tailor Decks build our screened porch and deck. Everything was handled professionally from the initial meeting and price quote through completion. Once the project was scheduled and the construction began, the crew arrived each day at 7:30am. They continue to maintain our spaces. You simply can't go wrong with this company!" John and Tailor Decks built our deck in 1995 and it still looks updated and new. John is a true craftsman and the finest, most reliable contractor we've ever had the privilege of working with. You will never regret your decision to hire Tailor Decks."